A problem of wave propagation in a rectangular waveguide containing a three-layer ferrite-dielectric-ferrite (FDF) structure has been considered in the paper. The calculation of a free-space FDF structure usually runs into difficulties. The proposed approach has been made it possible to obtain a rigorous solution for the waveguide modes for which there is no dependence of electromagnetic fields on a coordinate directed along a magnetizing magnetic field. It is the main mode of the FDF structure that governs principal properties of a phased array. The obtained relationships were shown to describe the modes’ behavior for a free-space FDF waveguide. 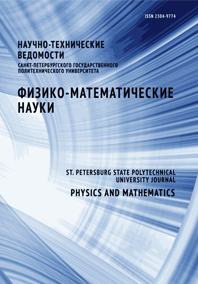 The dependences of the mode propagation constants on the magnetizing magnetic field were calculated, electromagnetic field structures of the main and the higher modes were found. The optimal structure parameters were determined. They are optimal when the controllability of the FDF structure by a constant magnetic field is maximal.